The Mayan civilization was considered to be the parent culture from which all other Mesoamerica societies evolved. But, the Olmec were, in realty, the cultura madre, the mother culture. 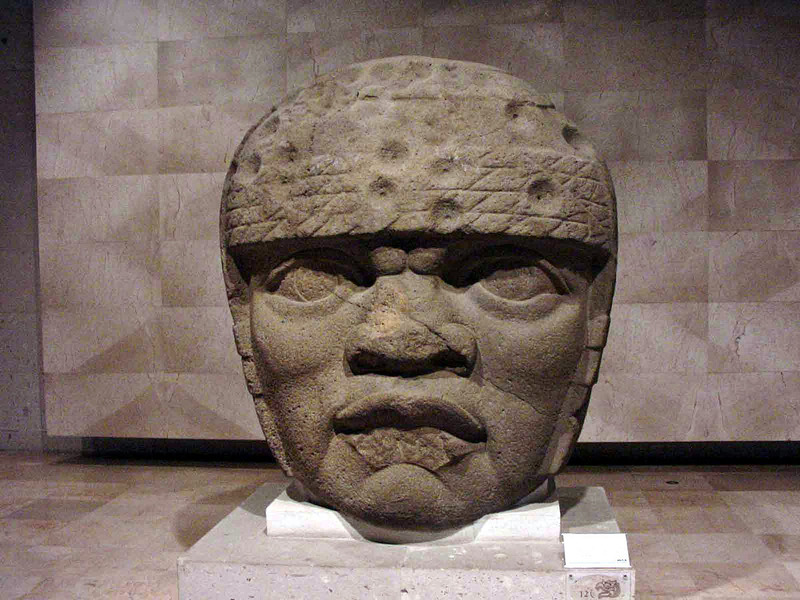 Most scholars agree that the Olmec were prominent from as early as 1500 BCE to 100 BCE. Their primary territory encompassed the Gulf Coasts states of Vera Cruz and Tabasco. However, there is an indication of their settlements extending to other parts of Mexico and a sphere of influence as far as Costa Rica; validated through the research of their vast trading network in Central America. In 1929, Marshall H. Saville, Director of the Museum of the American Indian in New York determined that the Olmec were an entirely different culture from the Mayan, through his analysis of their art. He named them the Olmec; a word that means “rubber people” in the Aztec language. The Olmec extracted latex from a type of cultivated rubber tree and mixed it with juice from a local vine to create rubber as early as 1600 BCE. The Olmec have been credited as the originators of the Ball Games prevalent among later cultures of Mexico. Rubber balls were discovered at the Olmec site of El Manati. Several of their ancient Ball Courts have also been located. The Olmec are most noted for the huge distinctive Helmeted Head Carvings. The most interesting aspect of these massive sculptures is the resemblance of the Olmec to the native people of Africa. These huge heads, the oldest known monuments in pre-Hispanic Mexico, were carved from volcanic basalt. Some of these heads stand as tall as 6 feet, as wide as 5 feet and weighing as much as 40 tons. These monumental statues are what seem to be portraits of individuals whose helmets are engraved with an identification motif for that person. Some of the characteristics of the heads are the down turned mouth and the slit like slanted eyes. The down turned mouth is said to be a representation of their belief in the crossing over and transformation into the most powerful predator of the rain forest, the Jaguar. Besides the Jaguar, there are more than 10 gods including the Rain Spirit, the Corn/Maize God, the Fire God and the Feathered Serpent. They are also known for small jade carvings, jewelry and the accuracy of their depiction of human anatomy. They are also credited for the use of true zero, several centuries before Ptolemy. Being mathematicians and astronomers, they created accurate calendars, using a system of dots and bars for counting; the value of 5 was represented by a bar and the value of 1 by the dot. This system was later adopted by the Mayans. It is also speculated that they may have had a form of symbolic and hieroglyphic writing. Another important accomplishment, are their use of underground drainage systems, that had been carved out of basalt rock. Research at San Lorenzo and other sites suggests that they used these systems as aqueducts to provide drinking water for their cities. It is not clear why the Olmec civilization disappeared. It may have been due to the major change of the river systems that supported their agricultural based society. Much is known about them but, there is still so much more to learn about the Ancient Olmec of Mexico.